CMYK 20ft Silver Moroccan Orb Ball String Lights can help you deal with it! It can adorn your party, garden, wedding, celebrations, bedrooms and Christmas tree, restaurant. 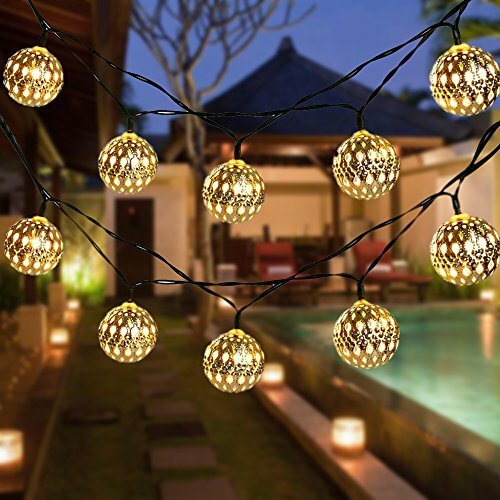 The design of the Solar Festive String Lights is really flexible and useful, making your holiday a sparkling one. Using the solar power to charge during the day, it illuminates for up to 8 hours with a full charge (require a continuous charge for 6-8 hours). The working time varies with the intensity of sunlight, location, weather conditions and shift of seasons. The solar lights have been tested and certified as IP44. It is definitely optimal decorating solution for outdoor areas such as front door, parasol, wedding, celebrations, patio, balcony, garden, dining areas and etc, now you don't need to worry about rainy day, right? Every ball is 0.98 inch diameter. Tiny but pretty. This is not a fully waterproof one, please keep it from a rain or damp environment. Light up all your DIY projects-- About 6.5ft lead cable and 13.5ft lights cover (20ft TOTAL LENGTH) moroccan hanging string lights bring the Outdoor & Indoor Decor come to life and makes your crafts so much cuter. Great touch for your spaces-- Made with 40 Silver Moroccan Orb(0.98 inch diameter), these led fairy light strands are an attractive scene around your deck, carport, porch, backyard, tapestry, photo frame, wall decor. Convenient solar powered design: No other equipments required, it illuminates for up to 8 hours with a full charge. Well built waterproof lighting-- The waterproof grade of the String Lights is IP44, No worry for rain drops. Also a perfect gift for your friends or families. Two modes to choose-- Can be switched into flashing or steady mode, the sparkly glow gives you a festive ambiance. If you have any questions about this product by CMYK, contact us by completing and submitting the form below. If you are looking for a specif part number, please include it with your message.